A behind-the-scene story about how interactions to high-school students lead to scientific advance. As a newly established research group, we faced the typical challenge of how to get our work off the ground with limited resources. With a lab renovation and equipment installation still in progress, it took some head-scratching to come up with experimental options in the early days. 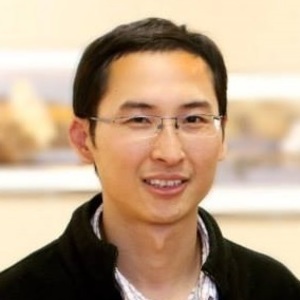 At this time my postdoc Bing Yin, armed with only the most basic tools at hand – a beaker and a hotplate – found that by mixing sodium hydroxide and zinc acetate dihydrate solutions at a temperature of 40 °C, he could produce many synthetic zinc-oxide (ZnO) microparticles, each featuring a forest of high-density nanostructured spines (Figure 1). The microparticle resembles a miniaturized sea urchin (about 10,000 times smaller than life-size). I thought the structures were interesting but did not have a concrete idea as to how they could be utilized. At the time, we were hosting a summer visiting program. We invited high-school students from a local public school to our lab, in an effort to promote science, technology, engineering and mathematics (STEM) among pre-college students. Our group had newly installed a desktop scanning electron microscope (SEM) that could image submicron features. Because conventional SEMs are often a shared facility installed in a cleanroom environment and not accessible to visitors, we thought this tool might open to pre-college students in western Massachusetts a rarely-glimpsed window into the nanoscale world. Still limited in terms of availability of materials, I myself went out to the building grounds, captured some ants, glued them onto a silicon substrate, and put them into the SEM to show the students (Figure 2, top). My hope was that the extremely enlarged image of an ant, perhaps a bit scary and monster-like, would excite the students’ interest in the ordinarily invisible nanoscale domain. I even did a little homework in elementary entomology to enhance my presentation. It worked. In fact, not only did the students show great interest, but I myself was unexpectedly intrigued by the microscopic features of the ant (Figure 2, bottom right). Although I knew in a general sense that insects can have tactile hairs as mechanosensory organelles, it was the first time I had visualized the fine structures in these hairs under the SEM (Figure 2, bottom left). 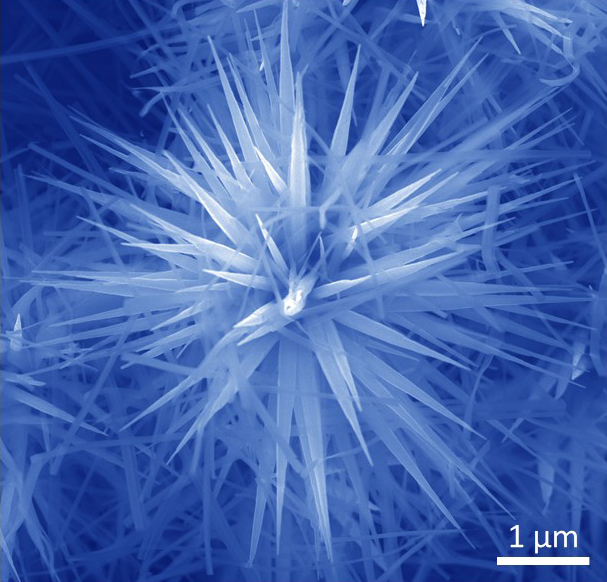 Instantly, their tapering geometry reminded me of the uncannily similar nanostructured spines covering the ZnO microparticles that Bing had synthesized (Figure 1). We naturally leapt quickly to the possibility of functional emulation, especially the potential for improvement in sensor design, as we knew that often nature had already optimized the functionality. A quick literature search taught us that the tapering spine (or bristle) in insects not only serves as a lever arm to promote mechanical-signal transduction, but also a clever strategy to protect it from mechanical breakage; the hierarchical distribution over the body further improves the multi-directionality of signal detection. We hypothesized that a thin-film sensor made from ZnO microparticles, covered with spines having both geometric and distributional similarities to the bristles in insects, could yield high sensitivity as well as durability. The fabrication of the thin-film sensors was relatively straightforward, but the result surprised us. The unintentional biomimicry led to vastly superior overall performance in the sensors, with a ten-fold improvement in key parameters (e.g., sensitivity, gauge factor, pressure detection limit) in comparison with many conventional mechanical sensors. This excellent sensing performance, coupled with the simple low-temperature material synthesis, signals great potential for the device in wearable technologies (e.g., for health monitoring) with improved signal and comfort. The reward, eventually, lies beyond the scientific potential of the discovery. When the high-school students heard the story, they were excited to have actually contributed to a scientific advance, if indirectly. We hope that this experience will profoundly motivate and help them to develop scientific interests in the long term, and in turn spread among their peers. While scientists often hope to entice younger generations to a scientific career by exposing them to exciting research, sometimes the process works the other way! The inspiration our research receives from the curiosity of students is direct and paramount. Figure 1. SEM image of a synthetic ZnO microparticle. Figure 2. 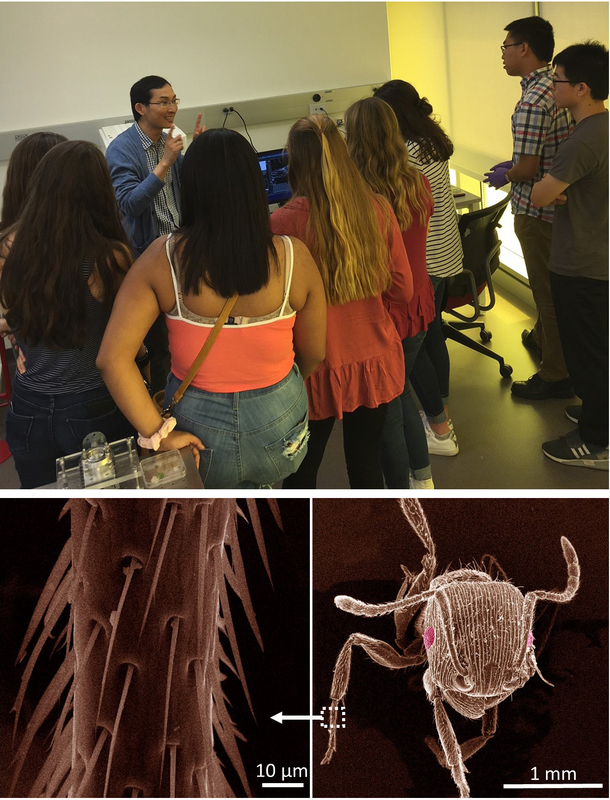 (Top) Demonstration of live SEM imaging of insects to high-school students. (Bottom) Actual images of an ant (right) and its leg (left) under the SEM.